Lathan Goumas - lgoumas@shawmedia.com Will Parker lifts his son Charlie, 2, to drink from a water fountain while at Northwood Middle School in Woodstock, Ill. on Thursday, Nov. 7, 2013. 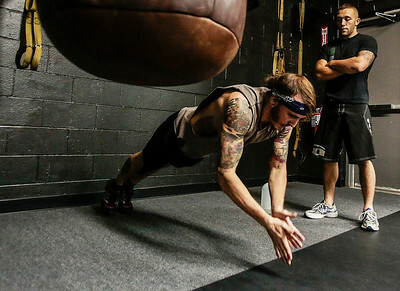 Kyle Grillot - kgrillot@shawmedia.com Vincent Romandine, a Corporal in the Marine Corps reserve, started his own personal training business called All American Training. Romadine works with one of his classes inside the Team Curran MMA building Wednesday. "Two years ago I decided I was going to start my own company and not necessarily work for somebody else to build their name," Romandine said, "If I do a great job, I'm building my brand now, to me that makes more sense." Kyle Grillot - kgrillot@shawmedia.com Vincent Romandine, a Corporal in the Marine Corps reserve, started his own personal training business called All American Training. Romadine works with Ben Beosiger of McHenry inside the team curran MMA building Wednesday. "Two years ago I decided I was going to start my own company and not necessarily work for somebody else to build their name," Romandine said, "If I do a great job, I'm building my brand now, to me that makes more sense." 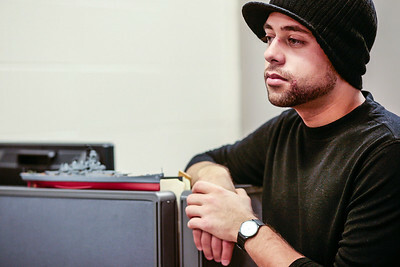 Lathan Goumas - lgoumas@shawmedia.com Student Veterans Resource Center liaison Steven T. Czarnecki poses for a portrait at the McHenry County College Student Veterans Resource Center office in Crystal Lake, Ill. on Thursday, Nov. 7, 2013. Czarnecki spent four years serving in the U.S. Navy aboard the USS Mesa Verde. Lathan Goumas - lgoumas@shawmedia.com U.S. Marine Corps Staff Sgt. 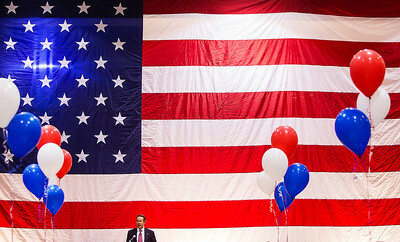 Chirs Perez before a program honoring veterans at Northwood Middle School in Woodstock, Ill. on Thursday, Nov. 7, 2013. Lathan Goumas - lgoumas@shawmedia.com Ret. U.S. Army Staff Sgt. Don Schroeder and U.S. Navy Capt. 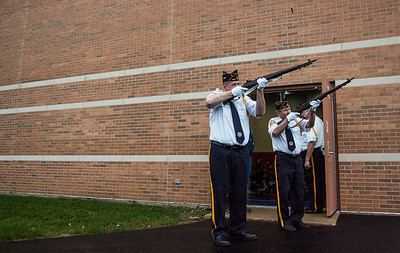 Ken Schroeder enter the Northwood Middle School hymn for a program honoring veterans in Woodstock, Ill. on Thursday, Nov. 7, 2013. Lathan Goumas - lgoumas@shawmedia.com Ret. 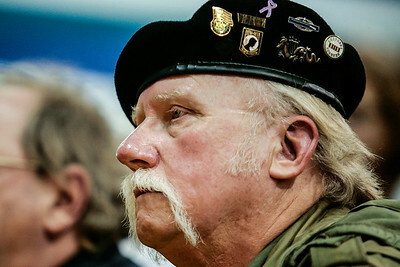 U.S. Army Specialist Eric Anderson listens during a program to honor veterans at Northwood Middle School in Woodstock, Ill. on Thursday, Nov. 7, 2013. Lathan Goumas - lgoumas@shawmedia.com U.S. Marine Corps Staff Sgt. Chirs Perez talks with Ret. 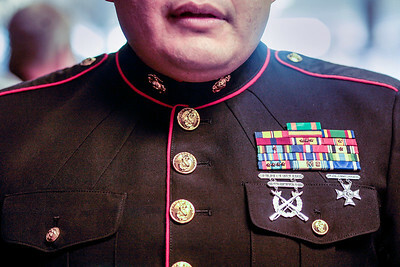 U.S. Marine Corps Staff Sgt. 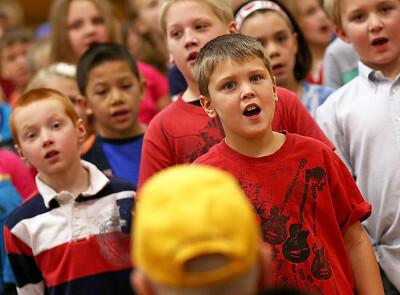 before a program honoring veterans at Northwood Middle School in Woodstock, Ill. on Thursday, Nov. 7, 2013. Lathan Goumas - lgoumas@shawmedia.com Northwood Middle School students portray a living Korean War memorial modeled after the memorial in Washington D.C. as United States veterans file into the gym for a program honoring them at Northwood Middle School in Woodstock, Ill. on Thursday, Nov. 7, 2013. Lathan Goumas - lgoumas@shawmedia.com Ret. 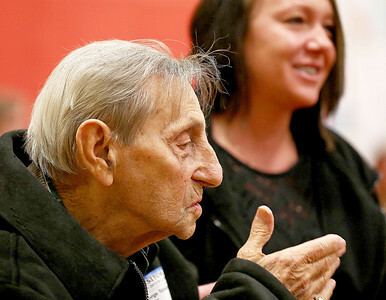 U.S. Army Specialist and Northwood Middle School janitor Barry Mishler is honored dying an assembly honoring veterans at Northwood Middle School in Woodstock, Ill. on Thursday, Nov. 7, 2013. Kyle Grillot - kgrillot@shawmedia.com Army Veteran George Mann (left) takes a moment during the playing of Amazing Grace during the Veterans Day ceremony at McHenry County College (MCC) Friday in Crystal Lake. The ceremony features two speakers, veterans Noah Currier and Ryan Blum, as well as patriotic music played by the MCC Concert Band and Chorus. Currier is a Marine Corps veteran, and Blum is an Army veteran, both served in Iraq and Afghanistan before taking on new leadership roles in McHenry county. 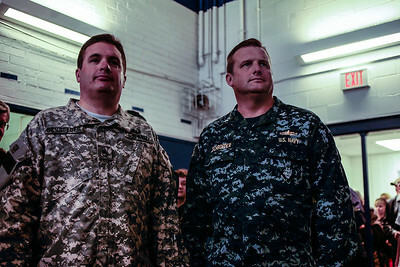 H. Rick Bamman - hbamman@shawmedia.com Post 673 Post vice commander Patrick Conley (left) and Commander Timothy Nash post the colors at the Huntley American Legion Post 673 at the start of the Veterans Day ceremony Monday, Nov. 11, 2013. 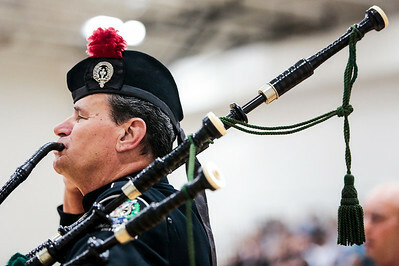 Kyle Grillot - kgrillot@shawmedia.com Bagpiper David Cormalleth plays the national anthem at the beginning of the Veterans Day ceremony at McHenry County College (MCC) Friday in Crystal Lake. The ceremony features two speakers, veterans Noah Currier and Ryan Blum, as well as patriotic music played by the MCC Concert Band and Chorus. Currier is a Marine Corps veteran, and Blum is an Army veteran, both served in Iraq and Afghanistan before taking on new leadership roles in McHenry county. 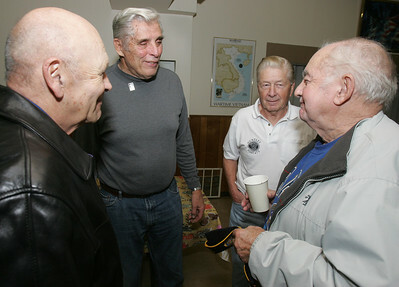 H. Rick Bamman - hbamman@shawmedia.com Veterans Rich Yorick, (from left) of Lake in the Hills, Butch Hacker, Ken Lavand, and Ronald Werner all of Huntley share stories after the Huntley American Legion Post 673 Veterans Day breakfast Monday, Nov. 11, 2013. 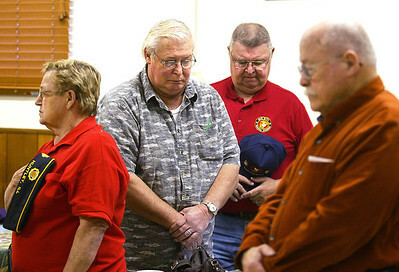 H. Rick Bamman -hbamman@shawmedia.com Veterans pray during the Huntley American Legion Post 673 Veterans Day ceremony on Monday, Nov. 11, 2013. Kyle Grillot - kgrillot@shawmedia.com The color guard advances towards the stage during the Veterans Day event at Crystal Lake South High School. 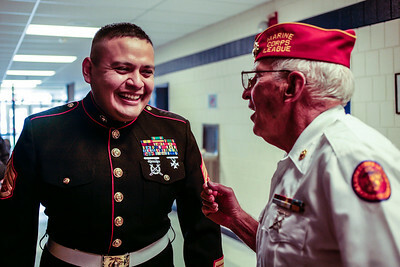 Crystal Lake South invited more than 500 local veterans to be honored at their event, held in the gymnasium Monday November 11, 2013. 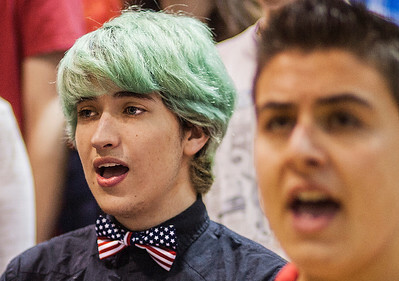 Kyle Grillot - kgrillot@shawmedia.com Crystal Lake South senior Dillon O'Neil sings the star spangled banner with the choir during the Veterans Day event at Crystal Lake South High School. 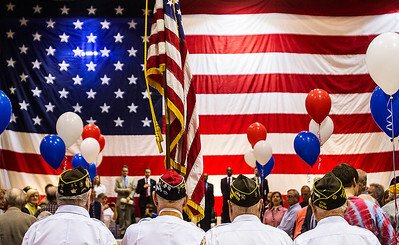 Crystal Lake South invited more than 500 local veterans to be honored at their event, held in the gymnasium Monday November 11, 2013. Kyle Grillot - kgrillot@shawmedia.com Mayor of Crystal Lake, Aaron Shepley gives a speech during the Veterans Day event at Crystal Lake South High School. 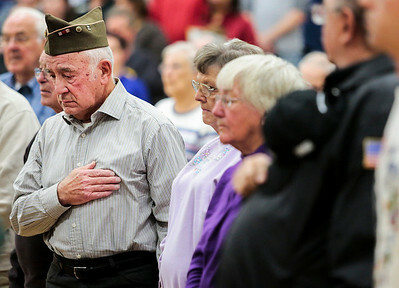 Crystal Lake South invited more than 500 local veterans to be honored at their event, held in the gymnasium Monday November 11, 2013. 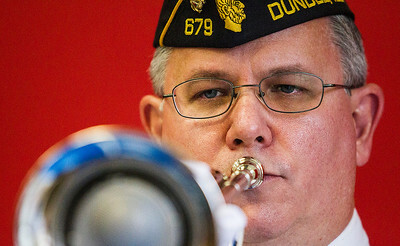 Kyle Grillot - kgrillot@shawmedia.com Dan Moore of Carpentersville plays taps with his daughter Gayle during the Veterans Day Service Monday at Parkview Elementary in Carpentersville. The service includes a parade of students, music, the posting of colors, a rifle salute, and playing of taps in observance of Veterans Day. 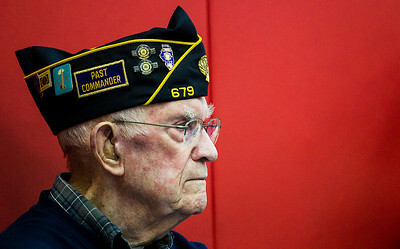 Kyle Grillot - kgrillot@shawmedia.com U.S. Marine Corps veteran Robert Christensen of Carpentersville stands to be recognized with other marine corps veterans during the Veterans Day Service Monday at Parkview Elementary in Carpentersville. The service includes a parade of students, music, the posting of colors, a rifle salute, and playing of taps in observance of Veterans Day. 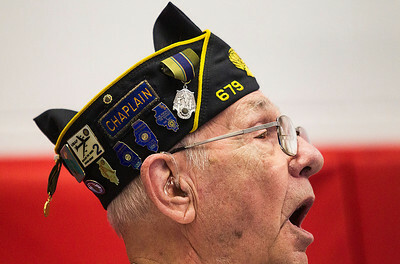 Kyle Grillot - kgrillot@shawmedia.com Larry Zea of the American Legion Post 679 sings God Bless America during the Veterans Day Service Monday at Parkview Elementary in Carpentersville. The service includes a parade of students, music, the posting of colors, a rifle salute, and playing of taps in observance of Veterans Day. 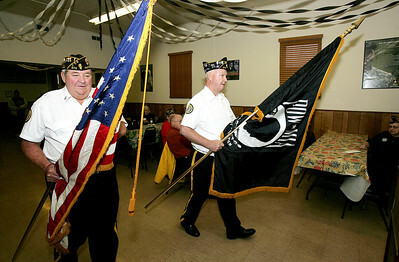 Kyle Grillot - kgrillot@shawmedia.com American Legion Post 679 members Joe Uehlein (left) and Jim Beal fire off three rounds during the Veterans Day Service Monday at Parkview Elementary in Carpentersville. The service includes a parade of students, music, the posting of colors, a rifle salute, and playing of taps in observance of Veterans Day. 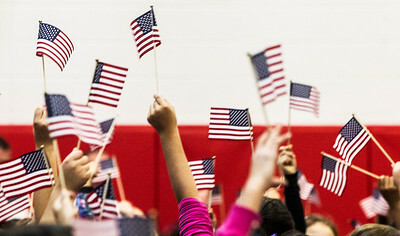 Kyle Grillot - kgrillot@shawmedia.com Students wave flags in the air to recognize the veterans attending their Veterans Day Service Monday at Parkview Elementary in Carpentersville. The service includes a parade of students, music, the posting of colors, a rifle salute, and playing of taps in observance of Veterans Day. 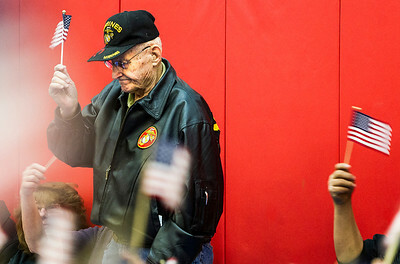 Kyle Grillot - kgrillot@shawmedia.com U.S. Army veteran David Lueck of Carpentersville listens to the closing remarks of Chaplain Dexter Ball of the Carpentersville Fire Department during the Veterans Day Service Monday at Parkview Elementary in Carpentersville. The service includes a parade of students, music, the posting of colors, a rifle salute, and playing of taps in observance of Veterans Day. Lathan Goumas - lgoumas@shawmedia.com Richmond-Burton High School curriculum director Belinda Veillon talks with U.S. Marine Cpl. 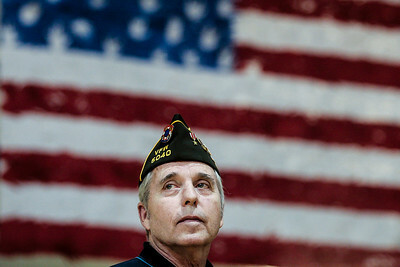 and 2008 Ricmond-Burton graduate Richard Schulze before a Veterans Day program at the school in Richmond, Ill. on Monday, Nov. 11, 2013. 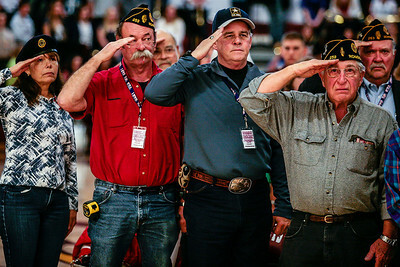 Lathan Goumas - lgoumas@shawmedia.com Veterans salute the flag during a Veterans Day program at Richmond-Burton High School in Richmond, Ill. on Monday, Nov. 11, 2013. 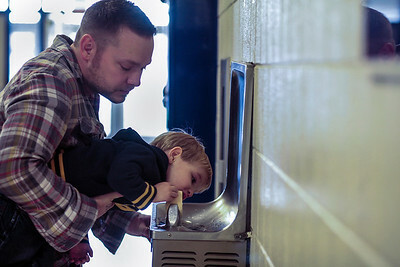 Will Parker lifts his son Charlie, 2, to drink from a water fountain while at Northwood Middle School in Woodstock, Ill. on Thursday, Nov. 7, 2013.